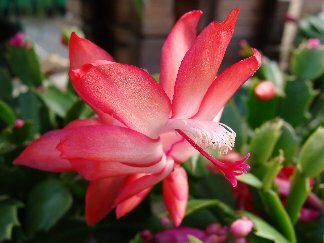 Christmas cactus prefers bright, indirect sunlight. After Christmas cactus buds have set, water liberally when soil is dry. The ideal temperature is between 55 – 70 degrees. 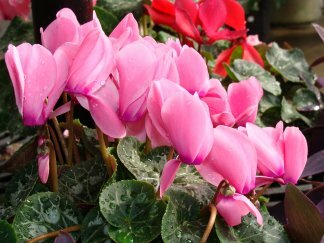 Cyclamen like a bright room away from direct sunlight. Keep soil evenly moist. These plants prefer cooler temperatures around 50 – 60 degrees. Kalanchoe plants prefer bright, diffused sunlight. However, they do not like direct sunlight. Keep soil on the dry side. They like temperatures between 65-70 degrees. Miniature rose plants like bright light, which is needed for them to bloom. Keep soil moist, but not soggy. Reduce watering in winter. They prefer cooler temperatures (in the 60’s). The poinsettia is a favorite for the holidays. Place them in a spot that will get bright direct sunlight. Allow soil to become moderately dry between watering. Average home temperature away from a direct heat source is best.